There’s nothing like a bowl of piping hot soup on a hot summer day! 🙂 I was hungry for lunch and had nothing ready to eat, so I put this together using ingredients we had on hand. Heat olive oil in large pot. Add chopped onion and cook over medium heat a few minutes until softened; add garlic and celery and continue cooking for a few more minutes, not letting garlic burn. Add turkey and break into pieces; cook until browned. While turkey is cooking, toss in a big pinch of kosher salt and sprinkle with Italian seasoning (eyeball the amount to taste). Pour in chicken broth, tomatoes (with juice), beans (drained and rinsed), greens, and yellow pepper. Add more broth if necessary to cover the ingredients. Add several turns freshly ground pepper and salsa. Bring to a boil, then reduce heat and simmer 15 minutes. Meanwhile, in a separate pot cook pasta to al dente. Spoon a serving of pasta into individual bowls, then ladle soup over pasta. Garnish with Italian parsley and Parmesan cheese. Eat and enjoy! Our favorite soup, adapted from the original recipe titled “Recipe for Health: Hearty Three-Bean Soup”, printed in a magazine from a local hospital. 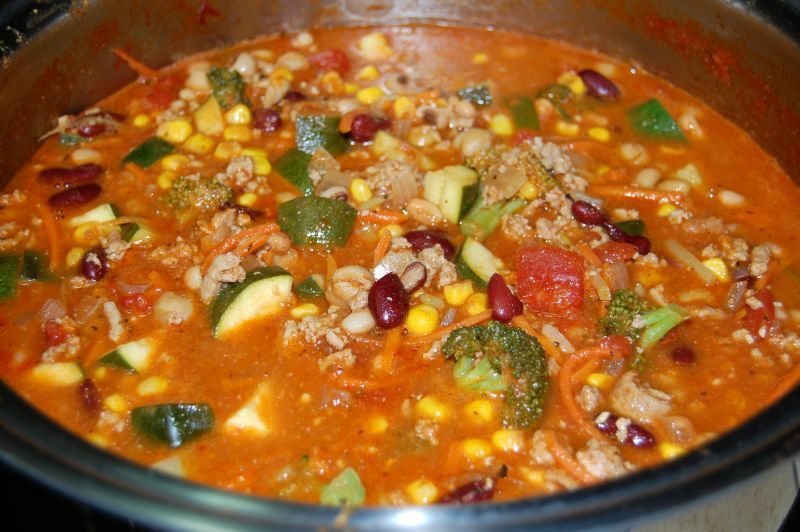 True to its name, it is very hearty, full of flavor, and chunky with lots of the good stuff! We’ve made it many times, adjusting the seasonings to suit our taste, until we settled on this recipe (most of the seasonings are approximately double the original amounts). This is a great comfort-food gift — what I call “A Hug in a Bowl” — everyone loves it and requests the recipe. We often make a double batch and freeze half for another day. It tastes even better the next day after the flavors have a chance to blend. (The photo above shows pieces of broccoli which I included on one occasion. I’ve also added shredded cabbage and you may need to adjust the liquid to accommodate extra ingredients.) It makes a complete meal in itself, but try it with Cast Iron Skillet Cornbread for a larger meal or a soup party! To make-ahead and freeze: Follow recipe except DO NOT ADD ZUCCHINI. (Zucchini will turn to mush in the freezer; ask me how I know!) Thaw, re-heat, then add zucchini and simmer for 10 minutes. This is my own recipe which was inspired by a similar one I found on-line. I just added a lot more vegetables, replaced the bouillon cubes with broth, used a bit more water, and made other changes until the recipe became my own. It makes a very hearty, nutritious, and delicious soup that can be enjoyed for days. It’s also very adaptable and the ingredients can be modified to suit your taste. Since some of the ingredients already contain sodium, I do not add any additional salt to this soup – but again, you may add it to satisfy your own taste buds. I arrived home from work one day to find Jim trying this recipe for the first time. Though I’m usually not a fan of split pea soup, I love this one — it’s very flavorful and delicious. Source: Soups from the Williams-Sonoma Cookbook Library. This is a very good, nutritious, hearty “stew” or soup. Original source: Fit or Fat Target Recipes by Covert Bailey and Lea Bishop.